Tire/fender clearance is determined by frame design. Well-designed frames generally have room for tires of reasonable width to be installed, and ideally there should also be room for fenders to be installed without risk of the tire's rubbing on the fender. The areas of concern are where the front tire fits through under the fork crown, and where the rear tire fits between the seatstays and chainstays. There's also often an issue with the vertical clearance between the tire tread and the underside of the fork crown or the seatstay bridge, or clearance between the tire and the brake caliper. Largely thanks to the efforts of Rivendell's Grant Petersen, calipers with longer arms are once again becoming available, and many bike manufacturers are once again making bikes that combine speed with versatility. If your frame has tight clearance, there's no easy fix. The only way around the problem is to go to a smaller-diameter wheel. This site has an article on conversions like this. The combination of these values determines how far you can lean over and still pedal without risk of striking your inside pedal. Pedal cornering clearance is a particularly important issue on a fixed gear bike, because the fixed gear forces you to pedal all the time. In addition, if you strike a pedal on a fixed gear bike, it will tend to lift the rear wheel up off the road, and you will spin out and crash. The other major area where clearance is an issue is when the rider's toe or toe clip can strike the back edge of the front tire or front fender. A leather, plastic or metal fitting attached to the bottom of a cycling shoe to provide positive engagement with the pedal. Classic cleats for use with toe-clip pedals had a simple slot that fitted over the rear edge of the pedal. This provided a consistent position of the foot on the pedal, both in terms of centering the ball of the foot over the pedal spindle, and maintaining the desired foot angle on the pedal. Up until the late '70's, cleats were leather or aluminum, and were nailed onto the bottom of the shoe with many tiny nails. The usual procedure was to have the cyclist ride for a while without the cleats, until the pedal would make a mark on the sole of the shoe. This mark would then be used as a guide to locate where the cleat should be nailed on. In the '70's, adjustable plastic cleats were introduced, and immediately rendered the nail-on system obsolete...unfortunately, they also precipitated a rash of knee injuries, because riders would adjust them by pure guesswork, and this often caused un-natural stresses on their knees. The invention of the Fit-Kit R.A.D. made it possible to adjust this type of cleat even more accurately than the old sole-impression system. Cleats for clipless pedals are made of metal or plastic, and lock into the pedal mechanism. They are adjusted in the same manner as the adjustable cleats of the '70's. Before the invention of clipless pedals, classic cleats were the only way to provide positive, accurate shoe/pedal attachment. They were rather dangerous, however. If the straps were overtightened, it could become impossible to get your foot out in an emergency, and many embarrassing falls have resulted from this. They also were slippery and hazardous to walk on. Modern clipless pedals have solved these problems, and, in my opinion, nobody should still be using classic cleats. Now that there is an alternative, they are just not worth the risk. This is the normal type of tire, with a separate inner tube. The tire consists of two hoops called "beads", made of steel or Kevlar cable, which are held together by cloth, usually nylon. The whole assembly is dipped in rubber, with thicker rubber applied in the tread area. The clincher tire's separate inner tube is basically a rubber balloon. This fits inside the tire, and the tire is mounted on the rim by lifting the beads over the edge of the rim. The middle of the rim makes a sort of valley (the "well"), and while the tire is being installed, most of the bead can fit into this valley. This gives enough slack to allow the bead to be pushed or pulled over the edge of the rim, even though the outside diameter of the rim is larger than the inside diameter of the bead. Strictly speaking, the term "clincher" is slightly incorrect, as it applied to an obsolete style of tire which had ribs in the edges of the tire which fitted into grooves on the rim, where the tire was folded under the tube. The air pressure in the tube pressed the rib into the groove, and "clinched" the tire in place. People who are fussy about this prefer the term "wired-on." Other types of tires include airless tires, single-tubes (both obsolete) and tubulars. Up until the late '80s, the choice was between plain pedals or pedals with toe clips and straps. Since "clipless" pedals provided a way to have a secure attachment to the pedal without the use of toe clips, the name stuck, even though it is sometimes confusing to newcomers. "Clipless" or "Step-in" pedals use a mechanism similar to a ski binding. In fact, the first successful system was made by a ski binding manufacturer, Look. Clipless pedals use a cleat which is bolted to the bottom of the shoe. When the rider steps on the pedal with the cleat, the cleat locks into the pedal mechanism, and is held firmly in place. Some systems hold the foot at a fixed angle, others allow various amounts of "float", or angular rotation of the foot on the pedal. With most clipless pedal systems, the foot is disengaged by twisting the heel outward. Some of the earlier systems, such as the pioneering Cinelli model, required the rider to reach down and operate a release mechanism by hand. This style is sometimes jocularly referred to as "death cleats." Club bicycles were the elite, high-performance machines of their time and place, England in the 1930s-1960s. They were popular with members of the many active cycling clubs. The poorer, less performance-oriented club members would ride sports bicycles, but the more hard-core "clubmen" would have true club machines. A club bicycle will typically have Reynolds 531 frame tubing, a narrow, unsprung leather saddle, reversed North Road handlebars (or drop bars), steel "rat trap" pedals with toe clips and 597 mm (26 x 1 1/4) or 630 mm (27 x 1 1/4) wheels. Even fairly high-end models had steel rims, which, at the time, were widely believed to be superior to aluminum. The steel Dunlop Special Lightweight rims used on the better club bicycles could give the aluminum rims of the day a run for their money. Club bicycles would be likely to have an exotic Sturmey-Archer hub, perhaps a medium- or close-ratio model, 3 or 4 speed, with an aluminum alloy shell. A very few even were equipped with the rare ASC 3-speed fixed-gear hub. Many club bicycles were single-speed machines, usually with a reversible hub: single-speed freewheel on one side, fixed-gear on the other. Starting in the late 1950's, derailers began to be used on this type of bicycle as well. Although primarily intended for fast group rides with clubmates, club bicycles were also commonly used for serious touring, and also for time-trialing. See also my Article on English 3-speeds. A group of rear sprockets on a multi-speed bicycle. If the bicycle uses a thread-on freewheel, the term "cluster" describes the entire assembly including the freewheel mechanism. 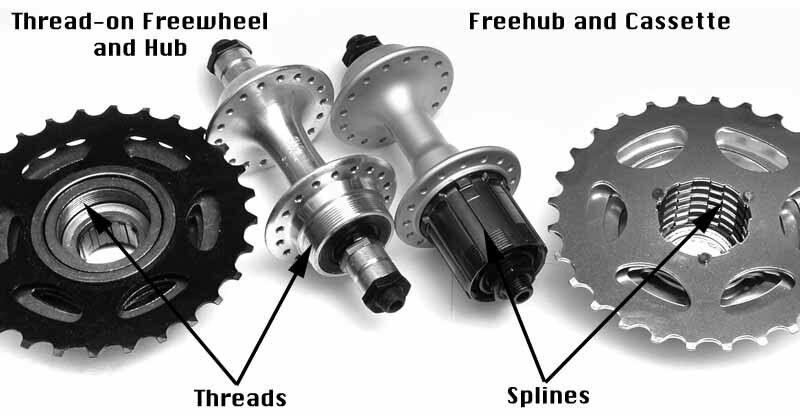 In the case of a cassette hub, the "cluster" consists of the sprockets and the spacers that separate them. The term "cluster" is used generically for any set of multiple rear sprockets, including both the freewheel style and the cassette. Many cyclists are confused by this important distinction, so I've written a special page explaining the difference between Freewheels and Cassettes, and how to tell them apart. Compact, Long Wheel Base , a variety of recumbent bicycle.